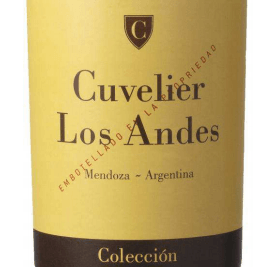 Los Andes Coleccion Mendoza Argentinian red wine from Family Cuvelier. The Family Cuvelier now has made a new Argentinian red wine, Los Andes Coleccion Malbec, The palate is charming, powerful and tasty, with a velvety structure and round tanins. It ends with a lingering finish. The Cuvelier family of Leoville-Poyferre in St. Julien is one of several French investors with projects in Argentina. Their Argentine adventure in the Uco Valley is called Cuvelier Los Andes, and they are part of the Michel Rolland-driven Clos de los Siete group. I was a little alarmed when I saw some alcohol levels surpassing the 16% mark, so I asked Baptiste Cuvelier, who is one of the four owners and the manager of the winery, and he kindly provided me with an explanation saying, “Our alcohol levels are always high, and that’s something that is not going to change because we have very low yields in the vineyard, five or six tons per hectare, we don’t buy any grapes, we wait for complete ripeness and do a full fermentation, so we’re always above 13.5% alcohol in all our wines. The average is 15% or 15.5%, which is usually higher in the Grand Malbec, which is mostly fermented in barrique, meaning there’s no alcohol evaporation during fermentation, unlike what happens when you ferment in vats. We can estimate that 1 to 1.5 alcohol degrees are lost during open remontages in the fermentation process. On top of the aromatic complexity and the cost, this is another of the reasons why we work with indigenous yeasts, which tend to use more sugar to produce one degree less alcohol than industrial yeasts. With industrial yeasts we’d probably be around 17% or 17.5%! Even though at 16% or 16.5%, alcohol is well-integrated. I have tasted 11.5% wines which seemed more alcoholic. For me Grand Malbec has the structure, acidity and aromas to disguise it... even if you have a bottle during lunch in the sun on the terrace!” I wouldn’t drink these wines in the sun myself, I’d rather have them in front of the chimney with a wild boar stew, but yes, they seem to be in balance. Their 55 hectares of vineyards are located in Vista Flores, Tunuyan, in the Uco Valley, planted at 5,500 plants per hectare at 1,000 meters altitude. Very powerful, ripe, concentrated and well-oaked, modern reds are produced at this address. Fermentaion : 7 to 10 days at 28ºC in stainless steel tanks. Maceraion before the alcoholic fermentaon takes place. This process takes 30 to 40 days. Ageing : 60% in French oak barrels during 12 months.